Here in Pittsburgh we have an advice columnist named Cat and she’s incredibly cute (don’t tell Sally!) and wears a hat that can only be described as jaunty. Cat gives advice each week from the human perspective, but I thought perhaps you would like to see advice on the same issues from the dinosaur perspective, because this dinosaur’s perspective is 65 million years wise. You might learn something. REX’S CALL: You don’t specify if they’re clipping their fingernails or their toenails. That matters. If they are clipping their fingernails, while that is a bit yucky, it’s not that terrible. Maybe they’re typing and they realized their nails are making clicky sounds. I can’t tell you how insane the sound of my claws clicking on the keyboard makes me. If however they are removing their shoes and socks and are sending sharp shards of ooze-encrusted toenail matter piercing through the air, then that is disgusting and classless and you should stomp them good then tear them limb from limb. Survival of the classiest. REX’S CALL: I can fix this and make you feel better, too. Here’s how. What you need to do, Ruin, is go to this man’s house and stomp him good then steal all of his valuables and send him a text that says, “That’s the dinosaur way.” Let me know if you need help. It’s Monday and cold here in Pittsburgh. So cold that we actually got some snow last night. And it’s Spring. And practically April. Oh, you humans and your big global warming joke. Ha-ha. Funny. 1. 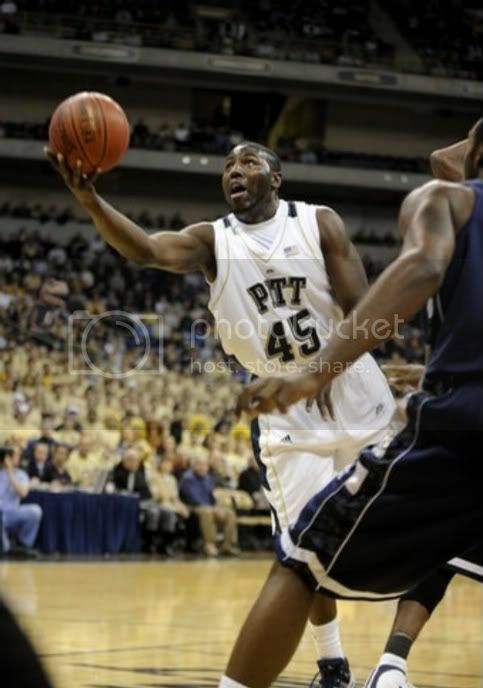 Pitt, it would appear, is NOT it. Mistah Cotter (har), I understand why you would want to be a dinosaur, but why in the world would AIP ask a mere human being to write their dinosaur’s blog? You write your human blog and I’ll write my dinosaur blog and no one gets eaten or stomped, deal? This is the moment a group of students tried to abduct a giant model dinosaur from a museum as a drunken prank. 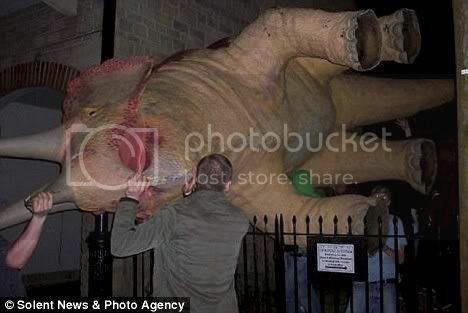 The young men had been out celebrating the end of their course when they walked past the life-size monster. Deciding to relocate it in the middle of a roundabout as a joke, they set about lifting the 20ft long and 10ft tall plastic triceratops. It took ten of them carry the giant model over an iron gate outside the Dinosaur Museum in Dorchester, Dorset. But just as they carried it off above their heads into the night, they were stopped in their tracks by a policeman. My God. I have friends that are Triceratops and when they are mad, they aim low. How drunk does one need to be to not care about what a Triceratops’ horn can do to your posterior? Trust me. I’ve seen it. It is exactly as gruesome as you’re imagining a triceratops horn to the posterior to be. Incidentally, I once tried to date a Triceratops (don’t tell Sally), but let me tell you. Horns. They get in the way. The museum’s website says the models ‘beg to be touched by little hands – and that is encouraged. 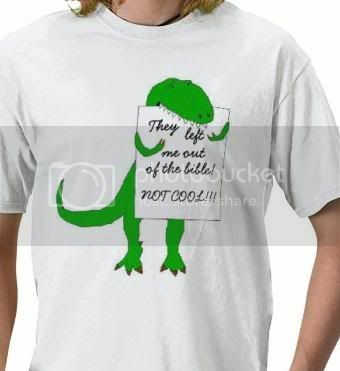 I realize you have been alive less than my 65 million years, so I don’t mind educating you about this. 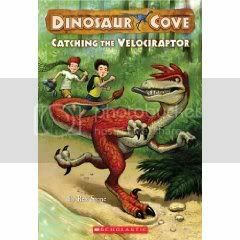 Life Lesson by Rex: Encouraging kids to manhandle a dinosaur is poor parenting. My final note. If you guys ever try to steal me, I will be picking Burgher meat from my teeth for weeks. 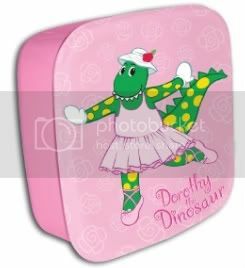 Our category today is animated dinosaur toys. 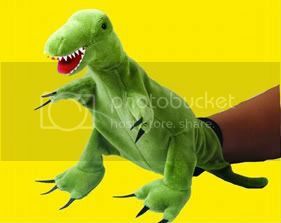 I don’t know what the heck kind of dinosaur that “Rex” is supposed to be, but I know that T-Rexes don’t have green leaves growing out of their spines. God. I bet “Dr.” Matt Lamanna designed this thing. 4. Hee. What? 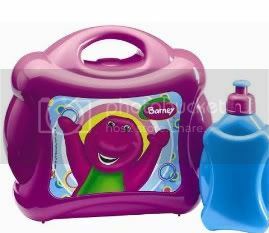 Like you wouldn’t kill Barney if given the chance. 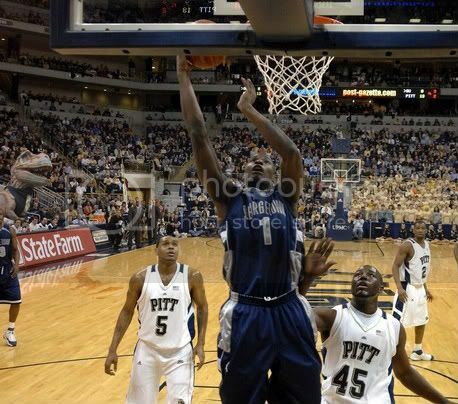 I guess my post about Pitt made my handler Norm start digging around the news photo archives because I received this email from him yesterday after I specifically told him not to send me a nasty email about my desire to show my support for Pitt, especially after yesterday’s win against Xavier and That Traitor Sean Miller. Rex, maybe you have an explanation for these? 1. How can you even be sure that’s me? That could be ANY muscular, handsome T-Rex. Any. 3. HOW BADAWESOME IS LEVANCE FIELDS TAKING A STEP BACK FROM THE LINE AND DRAINING A THREE LIKE IT’S NO THING TO BRING PITT AHEAD BY ONE IN THE CLOSING MINUTE OF THE GAME?! RAWR!!! 4. 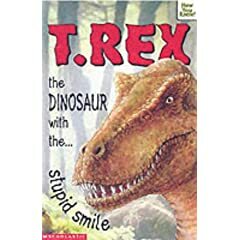 The guy sitting behind that dinosaur said very nasty things to him throughout the entire game, forcing the dinosaur to turn around and show him his teeth. I heard. 5. Look at the size of my biceps in that first picture! Hypothetically speaking. First off, so sorry for not posting anything yesterday. I thought I had a reading on the whereabouts of “Dr.” Matt Lamanna so that I could, ah, never mind. I don’t know where you’ll be tonight, but I’ll be glued to the television watching Pitt demolish Xavier and that traitor Sean Miller. Forgive me for not wearing my Pitt is It! shirt, but apparently my handler/wrangler Norm has better things to do than show his support for our local universities. I mean, I get that this is AIP and that I represent AIP … oh, I get it. Never mind. 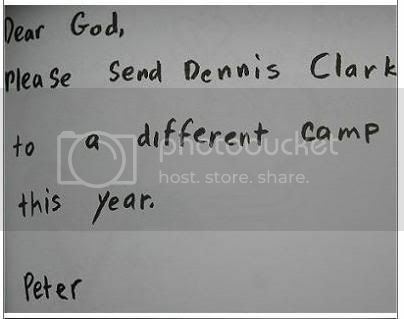 Don’t send me a nasty email, Norm. 2. The local mayoral election is getting fired up now with debates between the candidates being scheduled. I must say I find your “elections” with your “voting” and “civilized transfer of power” to be quite amusing. 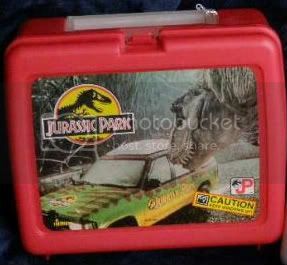 Seems to me the dinosaur way is best: whoever doesn’t get eaten, wins. 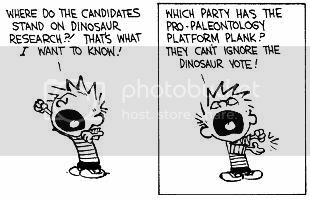 But since you’re all civilized and stuff now, I have got to wonder, like Calvin, where do the candidates stand on dinosaur issues? I speak on behalf of all dinosaurs when I say that we’d like bigger french fries, bigger urinals, stronger pavement, and the eradication of scary scary clowns. 3. The Pittsburgh Penguins are winning the Stanley Cup this year. I feel it in my bones and my bones are rarely wrong. Like that time that asteroid was coming at us and all the other dinosaurs were looking at it saying, “Oooooh. Pretty.” but I had a bad feeling and I went and hid in the mountain cave. Thank you, bones. If they do win, I better be outfitted in some serious hockey gear for the parade, do you hear me, Norm? I want a helmet and a giant stick and a Malkin jersey in XXXXXXXXXL and a puck bunny on my arm. Don’t tell Sally. Tyrannosaurus rex, a meat eater and the most famous of the dinosaurs (emphasis mine because it makes me feel good), was about 35 feet long. Figures for the longest and tallest are expected to change with ongoing finds in the Southern Hemisphere. Yeah, if they ever find my friend Andrew C. they are going to be astounded. Andy could crush fifty hadrosaurs with one foot. Also, have you ever had a hadrosaur pancake in your life? Delicious. 5. Finally, Norm wanted me to mention this event coming up here at AIP on Saturday: Sketchy Jr. This is a chance for students in grades 8-12 to draw to a live DJ and win prizes and stuff. 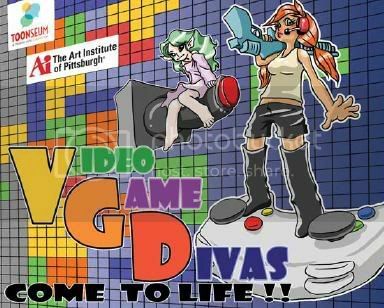 Norm tells me that models dressed as video game divas will be here. It was announced a day ago that the 2009 NFL season will begin with a Thursday night game September 10 between The Pittsburgh Steelers and The Tennessee Titans. As King of Steeler Nation (you can try to argue with me about that self-bestowed title, but if I bite you and there’s no one around to hear you scream, do you make a sound? Think about that. 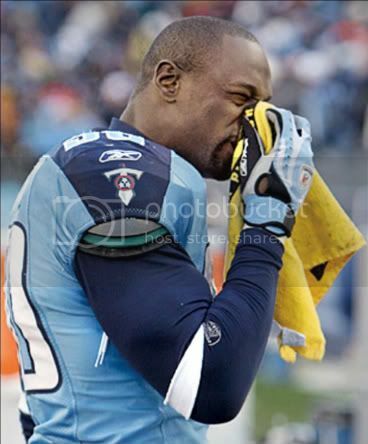 ), I want to remind you of what happened the last time the Steelers played the Titans. Are you dry-heaving like I am at the gross sight of this sacrilege? The stomping. The snotting. It’s all just too much for your friend Rex. I’m a Burgh transplant, it is true. I wasn’t born here. Heck, when I was born, there wasn’t even a HERE here. But the biggest truth — the truthiest truth of them all — never ever ever desecrate The Terrible Towel or bad things will happen to you. Things like asteroids and ice ages and not being able to score a single point against the Colts in your very next game after you did that terrible thing like stomping on and snotting on the Terrible Towel. 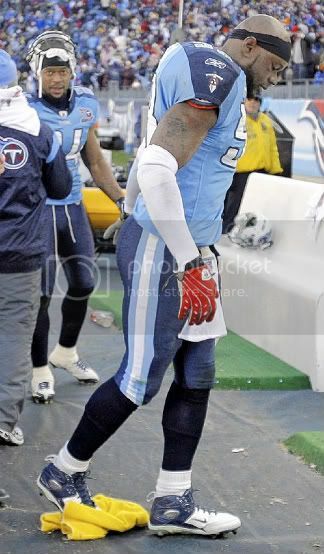 So I’ll be watching September 10 to see what awesome bad things are going to happen to the Titans. If I may be so bold, since I am a giant and all, I’d like to volunteer to wipe my snots with Keith Bulluck and then throw him to the ground before I stomp him good. Free of charge. Out of the goodness of my heart. 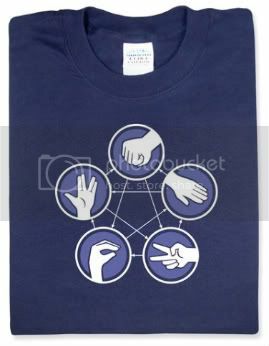 Do you watch The Big Bang Theory? I do. 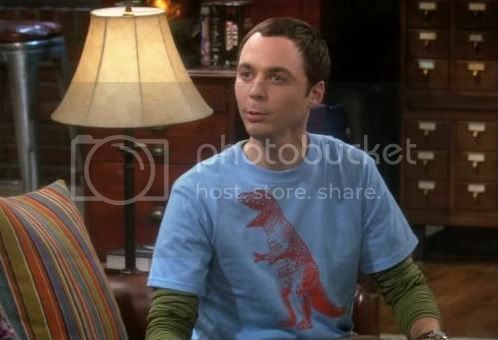 Penny is hot (don’t tell my girlfriend Sally) and Sheldon is my hero. 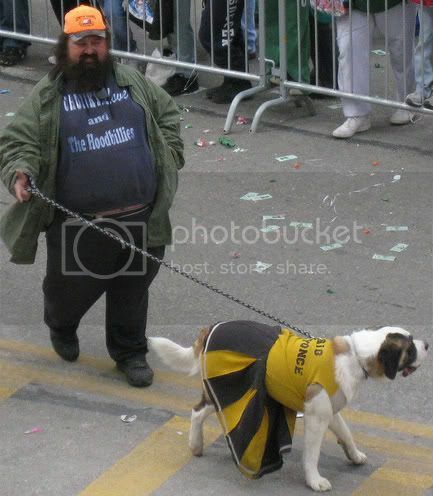 I wonder if I can get my handler to get me one of these in XXXXXXXXXXXXL so that I can shout back to Sheldon? 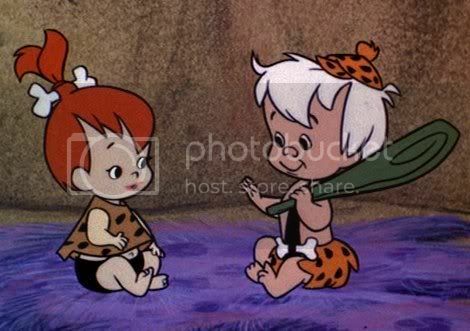 In case you’re wondering, Bamm-Bamm beats Pebbles. 1. 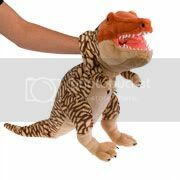 For instance, a T-Rex puppet for the kiddies. Guess why? Go ahead. Take a wild guess. I’ll give you a hint: location location location. I’d tell you how I feel about Barney, but this is supposed to be a PG rated website, and I bet my handler will have a problem if I called Barney a [redacted by Norm the Dino Wrangler]. Since I started my blog last week, I’ve begun to receive some lovely email from readers like you, and I wanted to start off this brisk Burgh day with a peek at some of those emails. I would like to say welcome to the 21 century. You have been a great land mark/mascot for The Art Institute for these past year. I would like to know what you would like to ware? Yes they dress you up in weird outfit’s but you need to have a say in it. You should ask the people who read your blog on what they think of your ideas. 1. 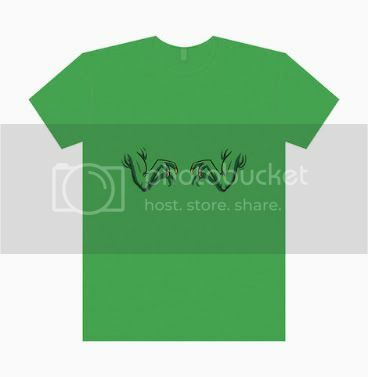 What I would like to wear? Hmm. In the winter, the fur of a woolly mammoth would do nicely to keep the chill out, but I bet PETA would have a problem with that and I’d probably wake up one day with my coat covered in red paint, or maybe some naked protesters ringed around me. You know what? I changed my mind. I do want a woolly mammoth coat. In the summer, I prefer to go naked. Air out that which creation gave me. 2. I wish I had a say in what I wear, but I don’t. All I can do is stomp and shout about it when I wake up and see what they’ve done to me. I will say this though, if I even SMELL bunny ears come Easter I will get very teethy about it. 3. Ask readers what they think about my ideas? 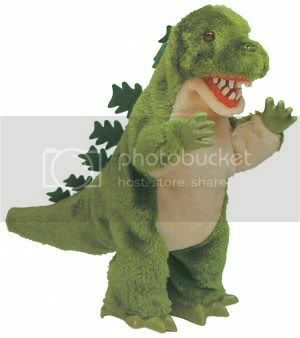 I’m 65 million years wise, I have large teeth and I’m capable of crushing people with my big toe. I can’t imagine they don’t agree with every single idea I have ever had or ever will have. It’s called survival instinct, if I’m not mistaken. Who is behind this? I’m an AIP alumni. Did Norm do this? Is it Norm!? 1. Look at the human, being all demanding of the dinosaur. 2. What do you mean “who is behind this?” Do you not see the title of the blog? My picture up there? I am behind it. Do I visit your MyBook or your FacePage and look at your picture and send you an email asking, “Who is behind this? I demand to know? !” No, I don’t, Lisa. I don’t. 3. Norm? Norm is my handler. He likes to refer to himself as my “wrangler” because he occasionally gets to tranq me when I get out of hand and attempt to hunt down and crush “Dr.” Matt Lamanna. The dinosaur expert being done in by a dinosaur? It’s poetic. It is on beautiful days like this that I find myself skipping happily down the Boulevard of the Allies, not caring at all about the giant claw-shaped potholes I’m leaving behind. No worries. Our mayor declared war on potholes last week, so I’m sure my tracks will be covered in no time. Watch your undercarriages, in the meantime. 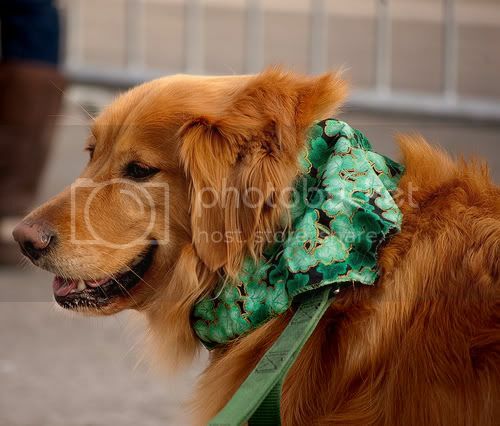 Let’s talk St. Patrick’s Day parade! As mentioned, I had the best seat on the street. Unfortunately my camera didn’t survive because I shattered it into a thousand pieces when I tried to take the first picture. It is very frustrating, sometimes, being the strongest most awesome creature on Earth. I have never seen such a large frog in my life. Juicy! And look, a belt for convenient flossing! Now we’re talking! Look at the size of that drumstick! That’s got to be from a woolly mammoth for sure don’t you think? Can I get that with french fries on top? 2. 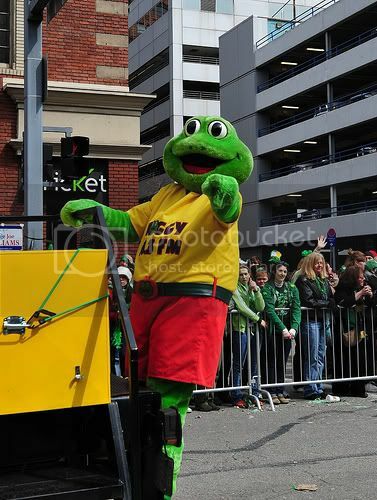 There were several things about the parade that confused me. Perhaps you humans can help a dinosaur out? 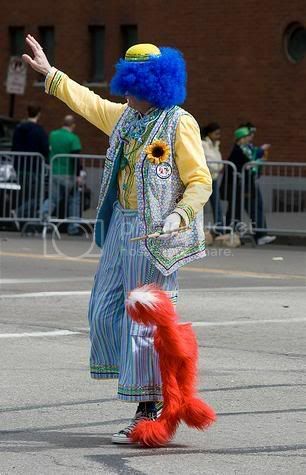 First, is this really an official member of the parade? If so, then am I understanding correctly that anyone that wishes to be part of a Pittsburgh parade can do so? How very inclusive of you. Second, as you can see, the dog’s name is Big Beyonce. In and of itself? Awesome. Coupled with the owner’s “Hoodbillies” shirt, peekaboo bellybutton and caveman beard? Magnificence. I might laugh for days at this. You humans know how to tickle a dino’s funny bone. 3. This confused me too. What does a giant banana have to do with Ireland? Really. I’m asking. 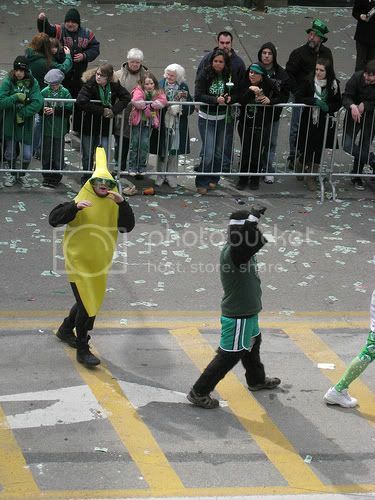 Are your children entertained by watching a person prance in a banana suit? Really. I’m asking. Educate me. 4. 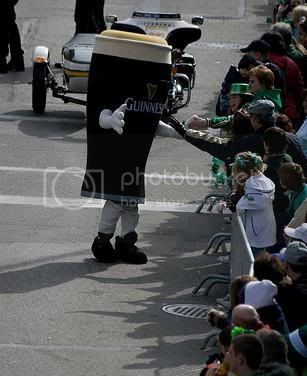 The Pittsburgh St. Patrick’s Day Parade. 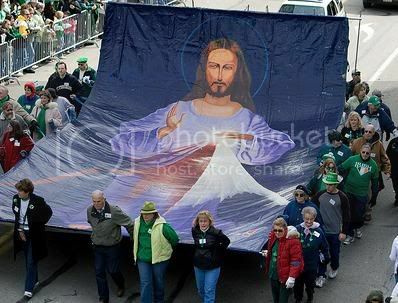 The only parade in the world where you can see both Jesus and a giant walking glass of beer. 5. 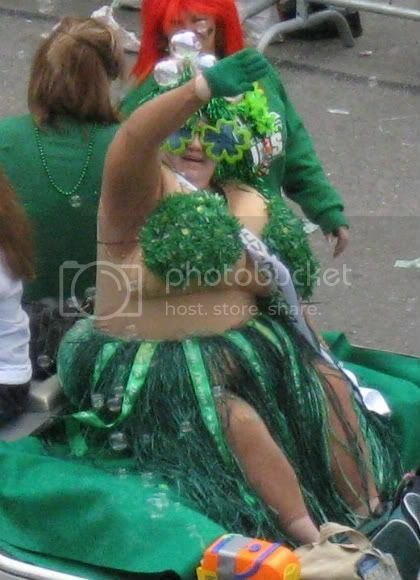 This, I’m told, is Miss Blarney Bubbles. Words. I have no words. Just questions. Lots of questions. 6. Do you ever wonder what it’s like to be a dinosaur looking down on all the little people and things? Here you go. It’s just like that, but with more running away screaming in terror. Because I’m very terrifying, you see. 7. Speaking of terrifying, I’m going to share a little secret with you. I’m terrified of clowns. I probably feel about clowns the way you humans feel about roaches. They’re creepy little things that should be crushed if they don’t scurry away fast enough. 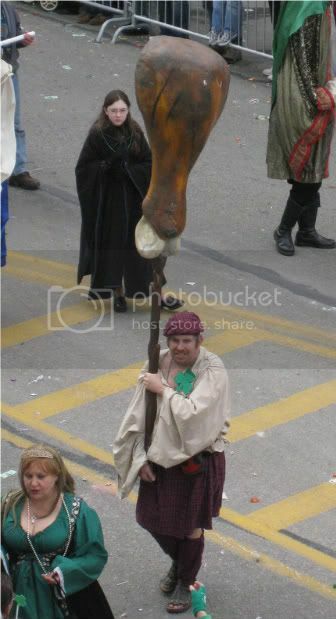 Look at this one that was in the parade. So to recap: parade = fun!, food = delicious!, clowns = scary!, and Elmo = dead. Thanks to all of you wonderful friends for the great photos. Next year? 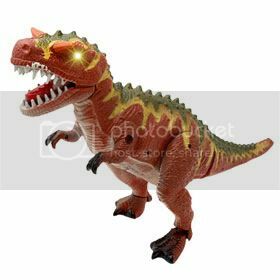 Take more pictures of that handsome and charming and terrifying dinosaur Rex. You know? The one cowering in fear of the clowns? 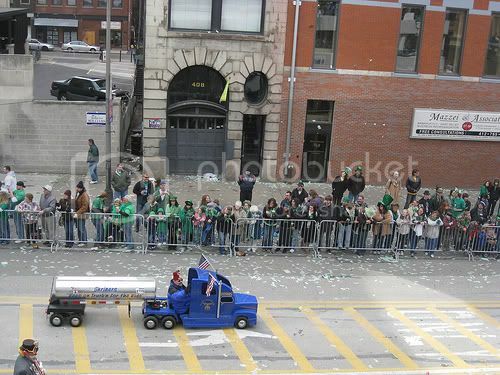 I’m going to get to my St. Patrick’s Day Parade recap today. Promise. It’s going to be awesome. Elmo is involved. I have a kind heart — a heart as big as a large dog, mind you — and that kind heart has a soft spot for human children. They’re so cute and honest and lovable and yummy. Relax. I’m not going to eat your children. I can eat 500 pounds of meat in one bite. Do you really think I want your M ‘n M-sized runt? Also, they’re slow. There’s no challenge in the chase. As I was saying, they’re cute and honest and lovable. 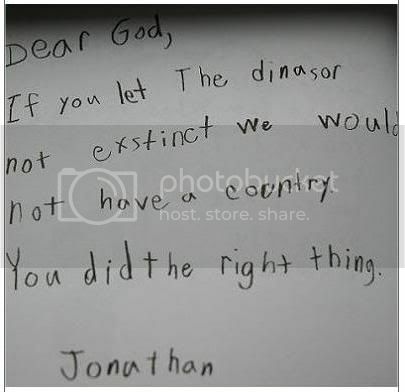 Look at these adorable letters to God some kids wrote. I agree! Dennis smells. Send him somewhere else. Cute kids. I don’t know who this “Jonathan” person is but first of all his spelling is atrocious. Dinasor? Is George Bush teaching your children how to spell? 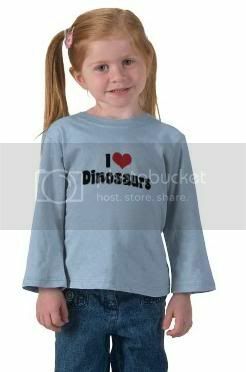 And if extinct was even a word, I’m pretty sure it wouldn’t be spelled like that. Second of all, I’ve read letters from boll weevils with better grammar than that. And third of all, Jonathan is a stupidhead and I bet he smells.